I love putting together Easter baskets! My mom always did an incredible job with our Easter baskets when I was kid. I love being a mommy now and getting to do the same. If you have read this blog for any length of time, you know I am a huge proponent in shopping sales and year-round. That ensures that: a) we don’t spend a ton of extra money in one month on gifts b) I always have a decent stockpile of gifts c) I can get REALLY great bargains. You can find lots of wonderful deals for Easter baskets even if you aren’t a year-round deal shopper like me. I highly recommend checking out The Dollar Store or the dollar section at Target and/or Michaels. These stores offers dozens of little gifts that kids love! I was amazed when I went to The Dollar Store this weekend at all the fun little toys and gadgets they had to offer (particularly in the realm of superheroes – Elias’s current obsession). Another way to find excellent bargains are by shopping on sites like Groupon, Zulily and Totsy. Each of these sites offer toys, clothes and gifts at significantly discounted prices. I love putting something personalized in my kids’ baskets. This year Elias is getting a superhero t-shirt with his name on it (I can’t remember where I ordered it from!) and Adeline is getting a personalized book from Paper Hat Press (we love their books!). For the photo I also tucked in her Baby Be Blessed doll because I think it would make a perfect Easter basket gift. (The dolls are handmade and include your child’s name and a special scripture verse). I also think it is important to include something faith oriented in your child’s Easter basket since Jesus is why we celebrate Easter. As much as I love the fun of Easter baskets and egg hunts, they do not replace the true meaning of this important holiday. 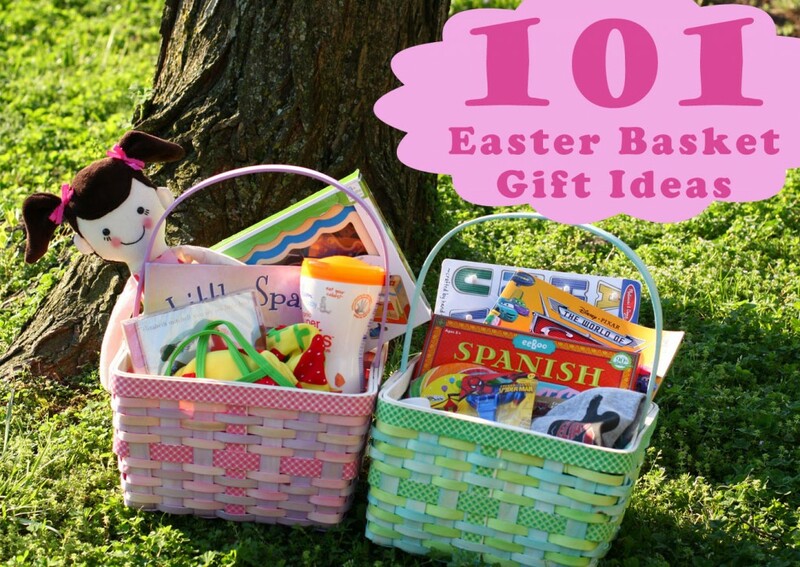 Below is a list of 101 Easter basket gift ideas. I hope it inspires you to put something you hadn’t thought of in your child’s Easter basket this year.